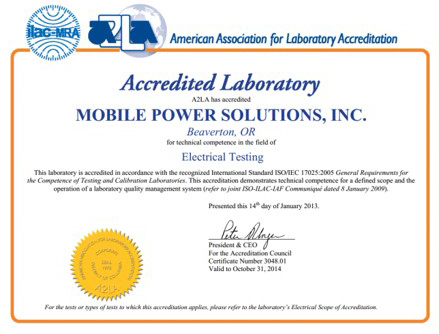 Mobile Power Solutions performs testing services that conform to customer and ISO17025 Testing Lab regulatory requirements. MPS professionally and effectively performs testing services to produce accurate and precise results. We encourage active participation of all employees in quality planning and continual improvement efforts to meet all quality, service and cost objectives.